Little Mousey bravely defends his best friend’s cookie from a host of hungry creatures. Best friends Sam (a boy) and Mousey (a mouse) love playing together. One day, Sam convinces Mousey to fly a kite with him and then surprises his friend with a giant chocolate-chip cookie. When Sam has to run to the toilet, he tells Mousey, “Watch the cookie. I’ll be right back.” This is no easy feat for a little mouse, especially as two threatening pigeons start pecking at Sam’s cookie. Mousey dons the red napkin like a superhero cape, empowering him to save the day by shouting, “Stop! 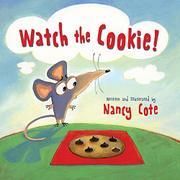 That’s Sam’s cookie!” Young readers will cheer on the little mouse as he tries to keep his friend’s cookie safe—little kids will understand “[t]hat’s just what best friends do.” Cote uses simple, straightforward text to keep the story rolling along at a brisk pace. Her cheerful illustrations are full of kid appeal, with expressive, cartoonish characters. There is a bit of inconsistency in the number of chocolate chips in the titular cookie: It gradually loses chocolate chips as it bumps through its travails, but suddenly the chips reappear just as the cat is going to eat Mousey.